Add this Lemon Cheesecake Cake and your dessert table will be full of lemon dessert goodness. I’m not a big fan of sour things. My kids think it is the funniest thing to try to trick me into eating sour patch kids or sour gummy worms. They have gotten me a few times, but now I know better than to take candy from them. Unless it is chocolate…then I grab it faster than they can take it back. Since sour things tend to make me pucker just thinking about them, I usually avoid lemon desserts. If you have been following along with my dessert journey here on the blog, you know that chocolate and peanut butter reign supreme. But then I decided to give lemon another chance. 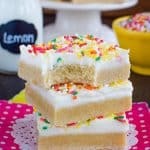 Last spring I branched out and made these Lemon Sugar Cookie Bars and realized that I do like lemon in small doses. Ok, so what I really realized is that I like cookies laced with lots of sugar and some lemon. But hey, it was a start into the lemon dessert world that I had been avoiding. Fast forward a year and I’m giving lemon another chance. And I’m still liking it. I have decided that when life gives you lemons, you should definitely make lemon bars! A few weeks ago I got a call from a girl from our new church. She runs a local bakery here in town, and her resident baker had left a few months ago. They had an order for lemon bars, and the current recipe in their folder was not working at all. It turns out the former baker must have been tweaking things. Sadly, I wasn’t much help for her that day. BUT…it did get me motivated to buy some lemons and a zester and to work on some lemon squares in our kitchen. After much research on easy lemon bars and looking at all my old recipes, I came up with a version of the Best Lemon Bars. Now I realized that calling something the best is very relative. Your best might not be my best and vice versa. Since I’m a fan of sweetening my lemon to keep my cheeks from puckering up too much, I wanted the base to be more cookie like. I had a feeling that the shortbread crust on these Salted Caramel Shortbread Squares would work, so I tweaked the base to fit an 8×8 pan. I also changed out the regular sugar for powdered sugar. The rich buttery crust in these bars worked so well, that I’m pretty sure I will be changing up the original every time now. Now on to the lemon filling. 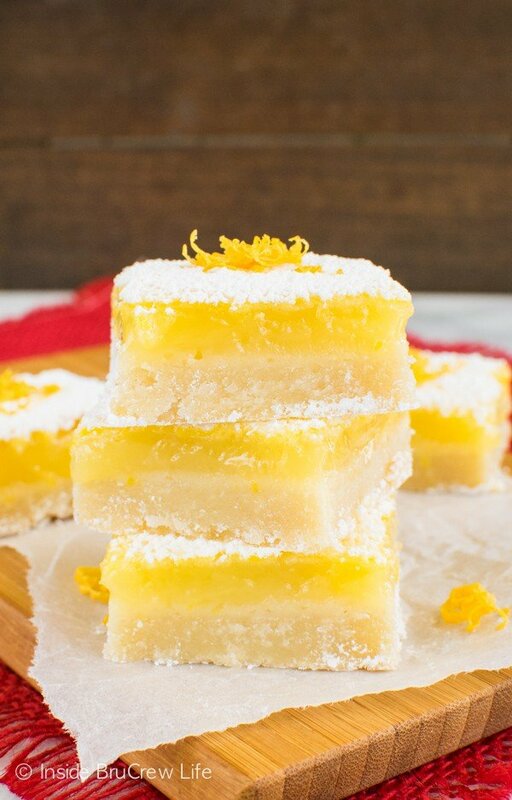 Fresh lemon juice and zest will give you more lemon power in these easy lemon bars. Also, the more zest you use will amp things up more. Since I’m working my way into loving lemon, I only used 2 Tablespoons of zest in the lemon curd filling. If you are a lemon lover, go for more! You could also add some zest to the crust if you wanted to give it more pucker. One of my favorite tools is this little dusting wand. A dusting of powdered sugar gives it a light and sugary finish. 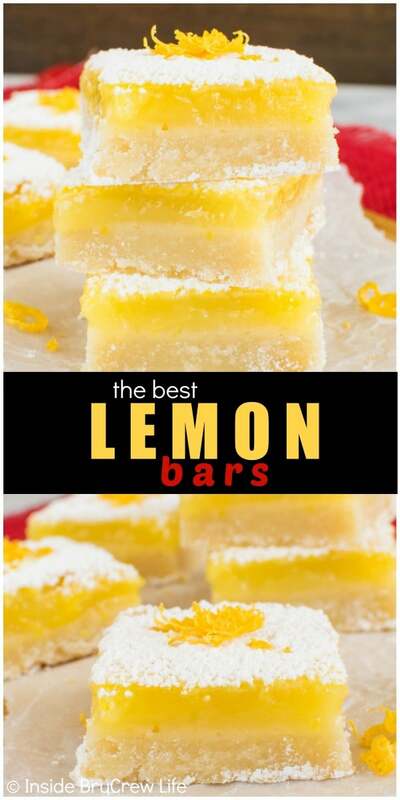 For someone who proclaims to not like lemon, I sure ate my fair share of these bars. Like I said, they are the Best Lemon Bars because I gave them a slightly sweeter twist. That’s how I roll around here. 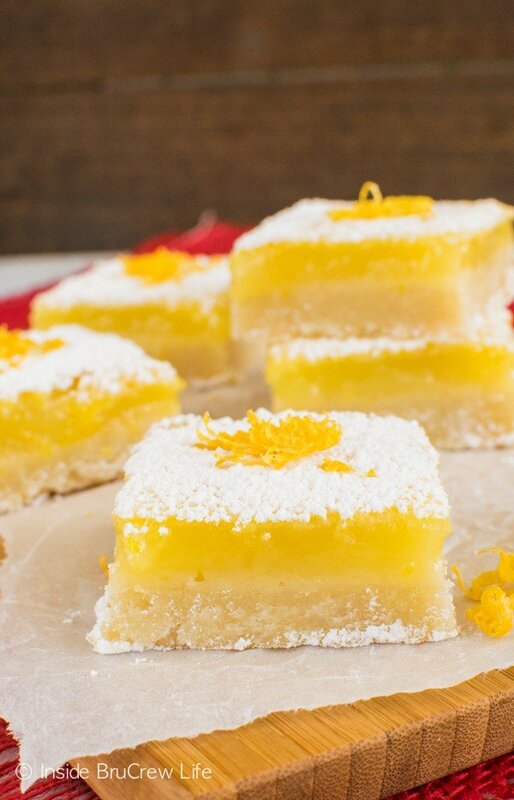 Do lemon squares freeze well? Yes, after the bars cool completely, wrap them tightly in foil or plastic wrap and freeze for up to one month. Thaw completely before serving. 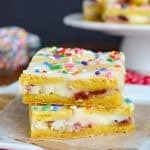 Do lemon bars need to be refrigerated? The lemon filling is basically a custard, so if you are not serving them the same day, they need to be stored in the refrigerator. However, if you are serving them at a party, they will be fine at room temperature for a few hours. How long do lemon bars last? It really depends on who is eating them. Around certain people, they will be gone in a day. But if you keep them in the fridge, they should keep for up to four days. How do you cut lemon bars neatly? Line your pan with foil or parchment paper, so you can lift the bars out easily when they are cooled. Cool the bars to room temperature, then refrigerate until firm. Use a sharp knife that has been dampened in warm water to make clean cuts. Press the dough into the bottom of the prepared pan. Bake for 20 minutes. 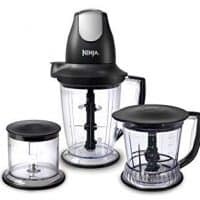 While the crust is baking, pour the filling ingredients into the blender and pulse until light and frothy. Pour onto the hot crust and bake for another 25 minutes. Remove and let cool completely. They will set up as they cool. Sprinkle with powdered sugar right before serving. Makes 16 bars. *This post contains affiliate links. Inside BruCrew Life may receive a small percentage from sales made through these links. As always, these free referral links do not cost you any extra. Thank you for letting us share products we use and love this way. Lemon bars are one of the first things I baked and photographed- never made it to my blog, but kind of gave me the idea to start blogging 🙂 These lemon bars look unreal! That filling is stunning. What a fun way to start blogging! You should make them again!!!! These are picture perfect and I am sure the taste is also…..I love these and look forward to making them….. Thank you…and I hope you enjoy them!!! I’m also PB and chocolate all the way, but then sometimes I’ll have a lemon dessert and be freshly surprised by how amazing it is! And these are so vibrant. 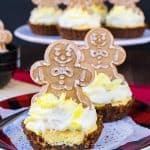 Gotta try them, especially with that thick shortbread crust! I’m usually chocolate all the way, but you are right…changing it up once in a while is nice!!! 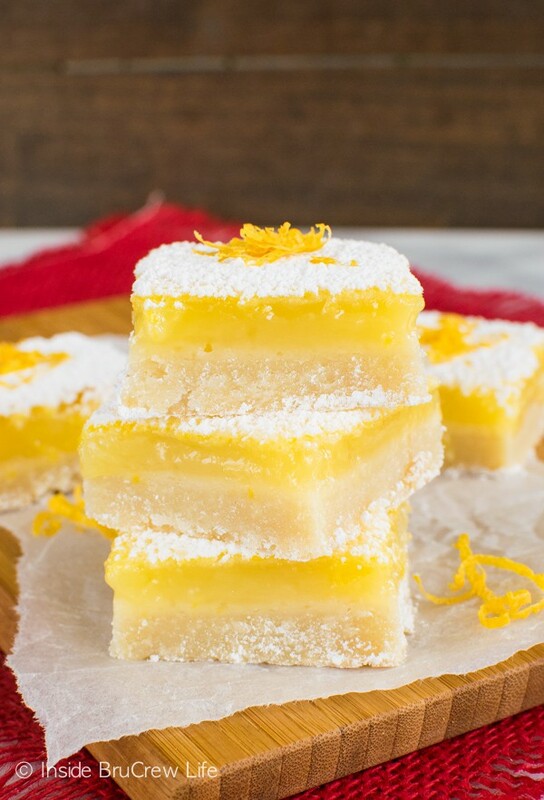 I’m just in total love with these lemon bars! They look so thick and delicious! Girl, they were so good! It surprised me how much I liked them! These look amazing Jocelyn! 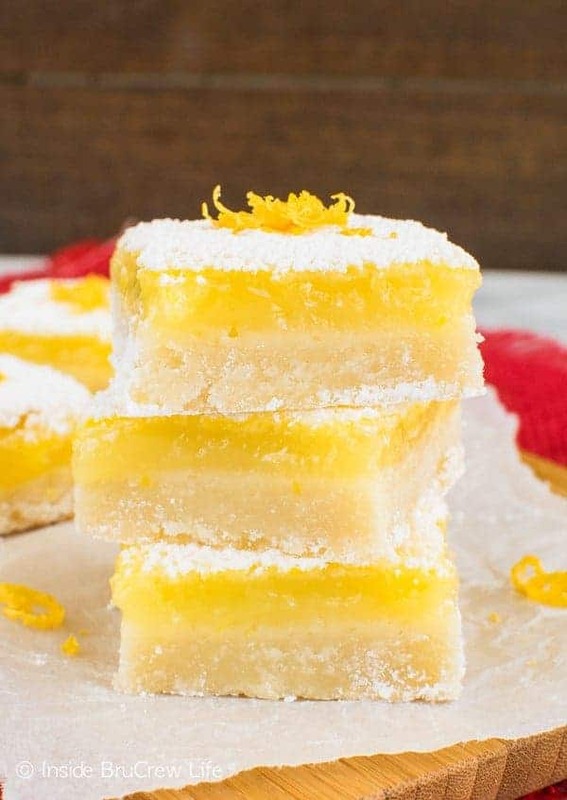 I love lemon bars and these are perfect for this time of year when the world feels like it’s starting to come back to life! Yes, lemon does kind of make me look forward to spring and newness of life around us!!! Lemon is pretty much my favorite flavor of ALL time. I get weak around lemon 🙂 These bars are stunning!! In the Filliing how much Powdered Sugar do I use when making these?? The powdered sugar goes on after the lemon bars are baked and cooled. Use as much or as little as you like. I hope you enjoy them! Hi! These look delicious, I just have one question, may be silly, but is it best to use freshly squeezed juice or would I be able to use bottled lemon juice? You can use either. I had bottled lemon juice in my fridge, so that’s what I used for these. I think fresh squeezed might give it a little more sour flavor…but I haven’t tried it that way, so I’m not sure. One question, the filling didn’t ever get very “frothy,” so it was very liquid-y when I poured it into the crust. Is that normal? Just a little concerned that the liquid won’t cook down enough. Thanks! Hi, Angie. Yes, the lemon mixture is very liquidy when you pour it on the crust, but after baking it will set up. Just make sure you left enough time for it to chill. I hope you like them! Hi Jocelyn-First of all, I enjoy looking at your website & trying the recipes. I have a very good lemon bar recipe too for a 9×13 pan but I am planning on trying yours….but I am going to use real lemons. Just a note for those that want to use real lemons, 1 medium lemon = 3 TBS of juice. 1/2 cup = 8 TBS…and the juice should be strained before using it. Oh, a room temp lemon will give you more juice too. Anyway, I have a question…I’m assuming that I just dump all the filling ingredients together & beat until light & frothy. After pouring on the hot crust and bake some more 20-25 min….what should it look like after 20 min? Am I looking for a little jiggle in the middle? And if there isn’t…bake 5 min more? I know you said the bars will set up as they cool. Please reply. Thanks so much. Thank you so much for the lemon tips. And the bars won’t have much of a jiggle after 20-25 minutes, they just won’t be able to be cut into bars until cooled. I usually can get about 1 Tablespoon zest from one large lemon. The filling will get bubbly and frothy and that’s it. It isn’t supposed to get like a meringue. It thickens when it bakes. I hope you enjoy the bars! Truth be told, I’m all about the pucker…love sour patch kids. ? So these beauties captured my attention immediately…I love sour, but I love buttery shortbread style cookies too – this looks like their perfect marriage / ratio of each! Also love how simple the recipe is…thank you! I am thinking of adding a shot of Limoncello in place of a shot glass of lemon juice. What do you think? I think that would be fine if you substituted the limoncello for some of the lemon juice. Keep me posted on how they turn out! These bars are looking amazing. Citrus taste is one of my favorite flavors that I want to taste. Thank you for the recipe. Hi, just made these!! 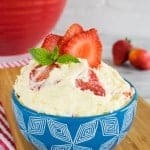 Great recipe, but one question, if I am making them today and not serving until tomorrow, do I store out or in the refrigerator until we eat them tomorrow? I always keep them in the refrigerator until I serve them. I hope you enjoy them!!! 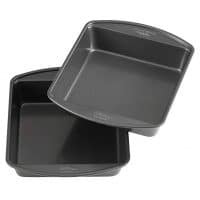 If I double the recipe, what size pan do I need and what is the cooking time? I’ve actually never doubled it, but I would say use a 9×13 pan, and the bake times should still be about the same. These look so nice and creamy. I can’t wait to make them for my family. I’m so glad you posted these lemon bars! My mom used to make lemon bars when I was a kid but when she died the recipe died with her 🙁 These are EXACTLY like she used to make! I’m making some in her memory tonight! That’s so cool that this recipe is like the one your mom used to make. Did you have a chance to make them? I hope they tasted just as good as you remember! That makes me so happy to hear you loved them!!! I made these for a co-workers birthday and everybody loved them! 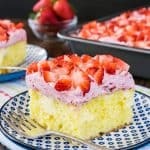 I will definitely be adding these to my cache of favorite recipes! Thanks for your sharing! Thank you for this recipe. They are delicious. I wonder if a substitute for the butter can be used, like Earth Balance? I know butter always tastes better. But, I’m lactose intolerant and also wanting to limit the saturated fat. I haven’t tried it with anything but butter. A lot of those butter substitutes have a lot of water content in them, so it can affect the end results of your baked goods. Keep me posted if you try it with anything else. 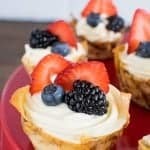 What do you think about trying these with gluten free flour? I honestly have never tried gluten-free flour, so I’m not sure. I have heard that most of the new gluten free products are easily interchangeable though. If you try it, please let me know know how it works. There are no silly questions. 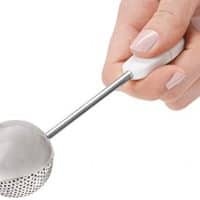 A hand mixer will work just as well. Just make sure to mix it long enough to be frothy. It won’t be thick, but it should be somewhat foamy. I hope you enjoy the bars! They are a favorite here! Can we use lime instead of lemon? You sure can. In fact, I used key lime juice in these bars. https://insidebrucrewlife.com/key-lime-bars/ Happy baking!!! !